Is the butterfly back after record lows? After years of concerning declines, the Monarch butterfly population is skyrocketing in the forests of Mexico where the butterflies spend their winters, a new survey has found. The increase in the butterflies was absolutely massive: there were three and a half times more of them this winter compared to last winter, and the vibrant orange and black creatures blanketed 10 acres of forest, according to a CBS News report. The survey was conducted by the World Wildlife Fund Mexico, which gathers the data by counting how much area the insects cover. The butterflies migrate between 1,200 and 2,800 miles there from the north, and then cluster tightly together on pine and fir trees. But there’s still a long way for this species to go. The population isn’t even close to where it was 20 years ago, when the total coverage reached 44 acres. Scientists blame pesticide use and land development for destroying the Monarch’s food, the milkweed plant. 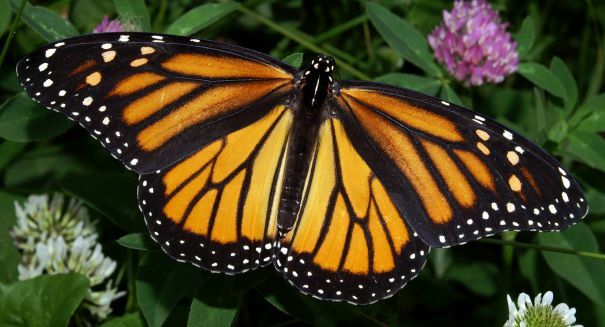 Scientists had expected the population to rebound at least a bit from last year because of better summer weather conditions in the Monarch butterfly’s breeding areas in the United States. It’s not uncommon for butterfly populations to fluctuate widely depending on the weather, but it’s still an encouraging sign. Something will need to be done about widespread use of pesticides for the changes to stick, however, experts say.